It’s probably no surprise that I’ve taken my fair share of cooking classes as well as given them since I’ve been living here in Istanbul. 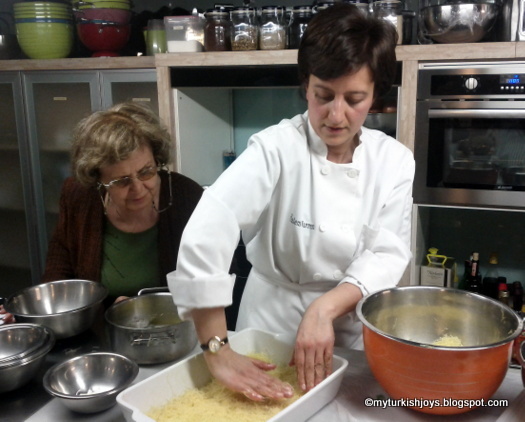 Last week, I met up with Ozlem Warren of London-based Ozlem’s Turkish Table here at the Istanbul Culinary Institute. 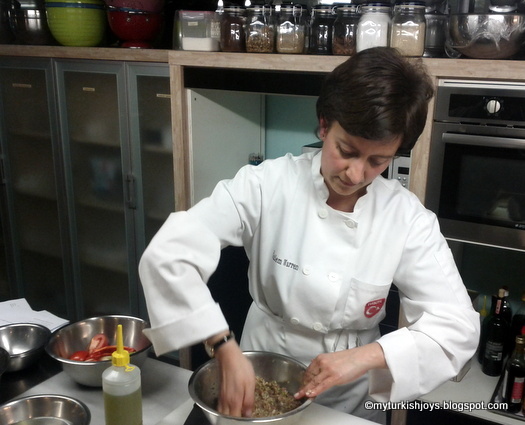 Lucky me, I had the chance to learn some more Turkish recipes from her in person. Last August, Warren and I met for the first time in person in Istanbul though we’ve both “known” each other through our blogs for nearly two years. 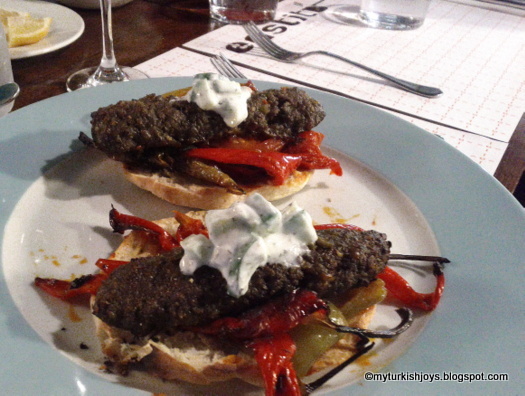 You can see that old post here: Turkish Cooking with a Chef, Blogger. Warren grew up in Antakya, a southeastern city in Turkey near the Syrian border, fell in love with a British man, moved away from Turkey but took her love of Turkish cuisine with her. In England, she teaches Turkish cooking lessons; and she often travels to Turkey to visit her family here. 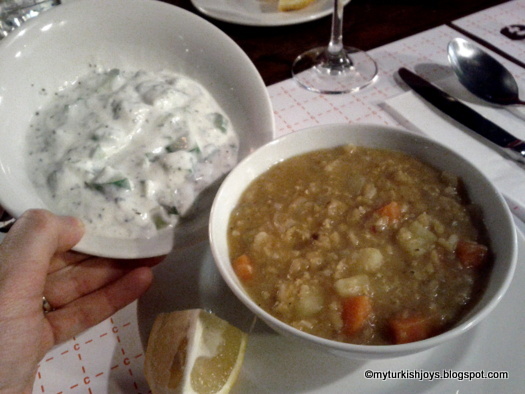 In last week’s class, we learned how to make one of Turkey’s classic soups and one of my most favorite soups - Mercimek çorbası (lentil soup). You’ll find mercimek served on almost every menu across the country, and when it’s not, I often wonder why! We made Warren’s heartier version of the soup with chunks of carrots and potatoes, garnished with crispy croutons. Mercimek çorbası and cacık (yogurt dip) at the end of the class. Next, we had to get the kebab meat mixed together, which almost like making an American meatloaf but so much tastier. (My mother made meatloaf nearly every Sunday so I now hate meatloaf with a passion.) Warren’s version of fıstıklı kuzu köfte kebab (lamb kebabs with pistachios) was packed full of flavor from the ground pistachios, pul biber, cumin, parsley and black pepper. Warren told us that in the Gaziantep area, minced meat is prepared by chopping it into the size of wheat grains with a special curved bladed knife called a zirh. She said hand chopped meat has a lot more flavor than machine ground meat since the meat retains a better texture. Warren mixes the lamb and spices together for the kebabs. Our finished lamb kebabs served with our roasted veggies over Turkish flat bread. We also roasted a large tray of veggies coated in olive oil and the spicy Turkish biber salcası (red pepper paste). Turks liberally use this paste in everything, but I never seem to quite empty a small jar before mold starts growing. Now, I know how to jazz up my roasted veggies. Finally, for dessert, we prepared the single most important Turkish dessert – in my opinion. Most people probably first think of baklava, but for me, künefe wins hands down every time! This was when Warren asked her mother, who was in attendance, to come and help her with the künefe. Her mother was very sweet, and stood next to Warren, telling her instructions. Mother and daughter have a little trick to make künefe even more decadent by adding chunks of Turkish kaymak with the special unsalted, creamy shredded white cheese. Sooo delicious! Warren and her mother making Turkish künefe for the class. 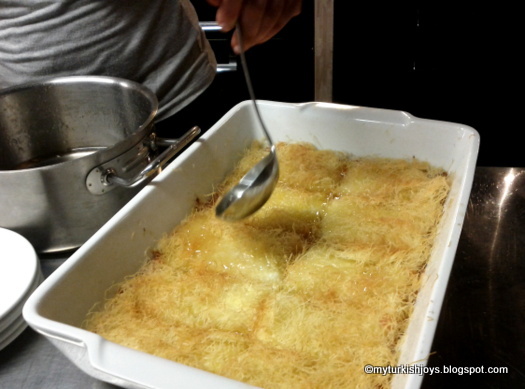 You must layer the kaymak and cheese on top of the butter-soaked shredded phyllo strands. Warren said she remembers her grandmother cooking the künefe out in her stone oven in the garden in Antakya. I’d be standing right next to my grandmother too if I knew hot künefe was coming out of the oven! Another trick I learned is that the künefe needs to be hot while the sugar syrup must be cooled down when it is poured over the whole dessert. This technique helps prevent the dessert from getting soggy. All in all, the class was another lovely night in Istanbul. I’m happy I have some new Turkish recipes to add to my cooking repertoire. Here is Warren’s Hearty Red Lentil Soup Recipe as well as her recipe for Lamb Kebabs with Pistachios on Flat Bread. 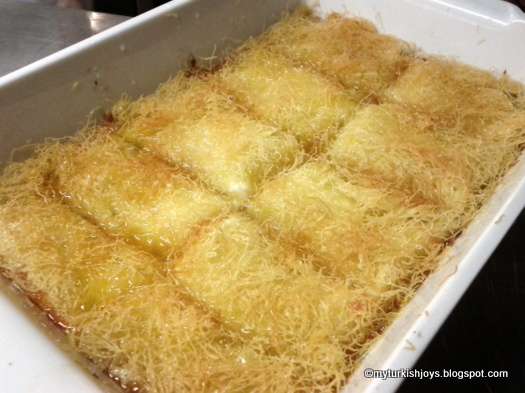 An amazing casserole dish filled with sweet Turkish künefe. I'd love to go to both Ozlem's and your demonstrations. Maybe one day! ps to stop the paste in jars going mouldy, pour a layer of olive oil over the surface. Pour off when you re-use it and then pour it back in again. i would so love to be at one of those classes! everything looks sooooo good! that is a good tip for the pepper paste too. @Joyce, yes you would definitely enjoy the classes too! @MJ, you're welcome dear! Thanks for reading! I cannot wait to devour your blog articles. I am friends with Ilke from "Ilke's kitchen" and have been chatting about our upcoming trip to Istanbul. I just tried some kunefe at our Middle Eastern store here in Houston, TX. It was absolutely delicious but I didn't know what it was called or what was in it. How fun to experience Istanbul through the eyes of an American!